History: Although Johnny had 105 races according to Greyhound Data, he has been retired to the farm for approximately a year. It’s time for this boy to learn about house living and real retirement. 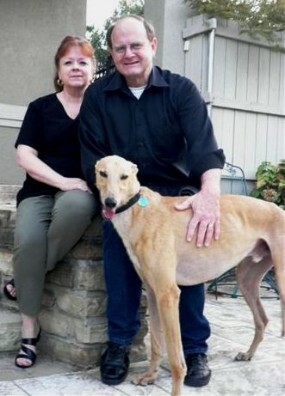 John (now Chase) with his new family Stuart and Glenda. July 22, 2011 update: Adopted! John spent a week with us (and our Springer Spaniel, 3 Greyhounds and 3 cats) while his foster mom was out of town. John did well with the cats after a while, and of course, had a blast with the Greyhounds. The first time he saw the cats he was extremely interested. He didn’t have a muzzle on so he wasn’t able to get very close. Once he had a muzzle on he was still very interested. I’m not sure if he was trying to play with the cats or not. After we told him NO in a stern voice, he seemed to be curious still but was afraid to make eye contact with them. He would sniff everything around the cat but not the cat itself! I think that in time John would be able to live with cats. He is such a sweet boy, I think he is most interested in playing! John knows his name (or names). He will answer to almost anything as long as petting or food is involved –John, Johnny, Papa John, Pizza Pizza. John has not changed much since he first came to TAGS. He acclimated to home living easily – kind of like he already knew the drill. Of course, having other Greyhounds in his new home probably helped. Everyone always says their fosters are “sweet, affectionate and friendly” and that’s John. I guess we could say he is “pleasing, loving and affable.” All describe John. John is fond of most things – sleeping, eating, being brushed, affection, riding in the car, going for walks, playing with toys, playing with the other dogs. He’s not fond of having someone mess with his feet but tolerates it. John is losing his kennel fuzz so he is still a two-toned boy. He will be a red fawn when his sun bleached hair is gone. Visit John and see for yourself what a handsome (he actually has a beautiful face even if he is a boy) and sweet boy John is. He may be the perfect addition to your family.